Ahoy Mateys! 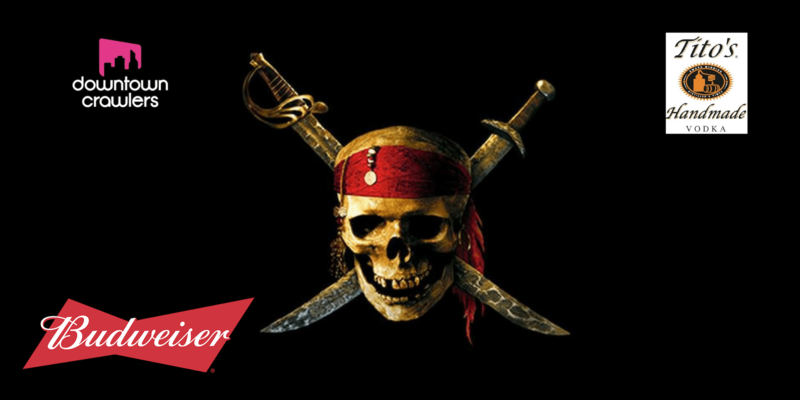 Arrrr you ready for our 2nd annual Gasparilla Brunch Barrr Crawl?! This time we will have 2 brunch options for you to choose from to start your Gasparilla experience (please indicate at check out where you would like to have brunch). The mutiny starts at 10am at District Tavern Tampa or Thee Tree House on Platt (formerly known as Platt Street Bourough). If you managed to get your hands on the limited brunch tickets*, you can enjoy a delish brunch buffett along with bottomless Mimosas as well as Tito's Bloody Mary's at the Tavern or at Thee Tree House from 10am - 12pm. Others are free to grab a drink and use our hop-on-hop-off buses to commute between our 3 participating bars District Tavern, Thee Tree House and The Franklin Manor for food and drink specials. We will be running a continuous bus loop between our three bars. Buses will run from 11:30am to 2:30pm and arrive every 30-45mins. At 3pm we release all Crawlers into the wild to watch the official 2019 Gasparilla Pirate Fest & Parade of the Pirates enter Tampa's Downtown. Franklin Manor is only a 5min walk away from all the action at Curtis Hixon Waterfront Park. PLEASE NOTE:Our buses will ONLY run between our 3 bars District Tavern, Thee Tree House and Franklin Manor. WHAT'S INCLUDED:Your BRUNCH CRAWL TICKET includes a delish Brunch Buffet with bottomless Mimosas & Tito's Bloody Mary's (from 10am - 12pm ONLY), a free welcome shot at each of the 3 bars, free bus transport, drink specials, bar games (beer pong, corn hole), our famous Beer Shotgun, other surprises and a raffle ticket for our Monday raffle to win drink vouchers and tickets to local attractions! Your CRAWL ONLY TICKET includes a free welcome shot at each of the 3 bars, free bus transport, drink specials, bar games (beer pong, corn hole), our famous Beer Shotgun, other surprises and a raffle ticket for our Monday raffle to win drink vouchers and tickets to local attractions! So bring your crewe or make new friends, discover new places, win cool stuff and have a good old time!